Background/Purpose: Systemic autoinflammatory diseases (SAIDs) are a genetically heterogeneous group of rheumatic diseases that are driven by abnormal activation of the innate immune system. As one of the SAIDs, the nucleotide-binding oligomerization domain like receptor protein (NLRP)12 autoinflammatory disease (NLRP12-AD) is an autosomal dominant disorder associated with the mutations in the NLRP12 gene. SAIDs have been hardly reported in the Chinese population, and NLRP12-AD has been reported only in Caucasians. We report the first case series of NLRP12-AD in the Chinese population coupled with literature review. Methods: Three Han Chinese adult patients with clinical phenotype suggestive of NLRP12-AD carrying NLRP12 variants were treated by the authors in 2015. Their phenotype and genotype were carefully documented and studied. A PubMed search for SAIDs was conducted between January, 1990 and January, 2016, and we focused on NLRP12-AD. Results: All three adult patients (2 men and 1 woman) developed periodic disease in adulthood. They presented with recurrent fever (n=3), polyarthralgia (n=3), myalgia (n=3), urticaria (n=2), lymphadenopathy (n=2) and erythema nodosa (n=1). All patients carry the NLRP12 mutation F402L. Based upon our analysis of the clinical data on a total of 26 patients with NLRP12-AD in the literature, both familial and sporadic cases were equally reported, and late-onset cases accounted for 28%. NLRP12-AD patients typically present with periodic fever, urticaria-like rash, arthralgia/arthritis, myalgia, lymphadenopathy and splenomegaly. Genotyping identifies the NLRP12 gene mutations, notably F402L (55%). Relative to the literature reports, our patients had the similar phenotypic and genotypic features. Patients with NLRP12-AD usually respond to glucocorticoid therapy. Conclusion: As one of the SAIDs, NLRP12-AD has been sparsely reported in the Caucasian population. Our report is the first to confirm its presence in the Chinese population. 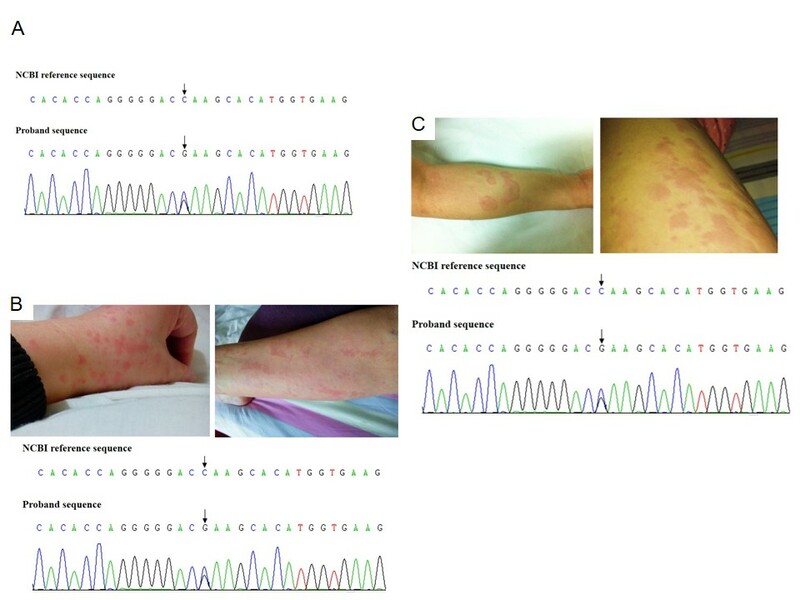 An awareness and screening of the NLRP12 gene mutations in patients with unexplained periodic fever syndrome may reduce misdiagnosis and improper treatment. J¨¦ru I, et al. Mutations in NALP12 cause hereditary periodic fever syndromes. Proc Natl Acad Sci U S A 2008; 105(5):1614-9. Borghini S, et al. Clinical presentation and pathogenesis of cold-induced autoinflammatory disease in a family with recurrence of an NLRP12 mutation. Arthritis Rheum 2011; 63(3):830-9. A table to summarize the clinical manifestations of 29 patients with NLRP12-AD A table to distinguish FCAS, NLRP12-AD, and cold-induced urticaria Fig. 1. A: NLRP12 mutation analysis and phenotype. Patient 1. Arrows indicate the position of the mutation; B: Patient 2. Urticarial rash on the limbs. Arrows indicate the position of the mutation; C: Patient 3. Urticarial rash on the arms and legs. Arrows indicate the position of the mutation. Disclosure: M. Shen, None; L. Tang, None; X. Shi, None; X. Zeng, None; Q. Yao, None. Shen M, Tang L, Shi X, Zeng X, Yao Q. NLRP12 Autoinflammatory Disease: A Chinese Case Series and Literature Review [abstract]. Arthritis Rheumatol. 2016; 68 (suppl 10). https://acrabstracts.org/abstract/nlrp12-autoinflammatory-disease-a-chinese-case-series-and-literature-review/. Accessed April 22, 2019.